Reminder: Build your own THE GOOD DINOSAUR Recyclosaurus, Win Prizes! THE ROCK FATHER's GOOD DINOSAUR Recyclosaurus Contest! Have Design Skills? 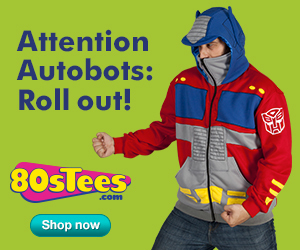 The POWER RANGERS and WeLoveFine Need You! This past Friday marked the 22nd anniversary Saban’s POWER RANGERS franchise, and to celebrate WeLoveFine launched its second Power Rangers t-shirt design contest. Have design chops? Then it's time for you to POWER UP your skills for a shot at some big prizes, and the chance to have your design turned into a piece of official Power Rangers merchandise! Prizes up for grabs include cool Power Rangers collectibles and cash (up to $1500). Join the Craftsman Club & Enter to Win a Chance to Attend the Craftsman MAKEcation in Brooklyn! THE ROCK FATHER has partnered with Sears as a paid member of the Craftsman Crew. Are you #MadeToMake? As a kid, the first tools that I ever came to know were Craftsman. Most of those were purchased from the classic Sears store in the long-gone Park Forest Plaza - a store that I have many memories of - a place that seemed larger-than-life. Of those tools, one thing that I eventually inherited was a set of screwdrivers from the late 70s/early 80s - the same ones I use here at Rock Father HQ today... the ones still sold by Craftsman all these years later, and still Made in the USA. They've been regularly-used tools for nearly four decades, and now I use them on my girls' toys. But age has instilled in me a growing urge to make things. The Indisposables are back, folks. And this time? That's right, we're taking you on a trip to an exotic place called Comfortopia - a land where you could win big - scoring all 10 of the Indisposable Comforts from an HDTV and XBOX to the simple things, like proper undies and a great pair of pants. In fact, there's over $5,000 in "Indisposable" prizes, and some of that glory could be yours.